Install XAMPP according to its documentation. These instructions assume XAMPP is installed into c:\xampp directory. If you install Apache and MySQL as services, you don't need to start them up manually when accessing MLInvoice. However, if you use MLInvoice rarely, having them up and running continuously uses up resources unnecessarily. You can setup or remove the services also later in the XAMPP Control Panel with the Svc checkbox. N.B.! 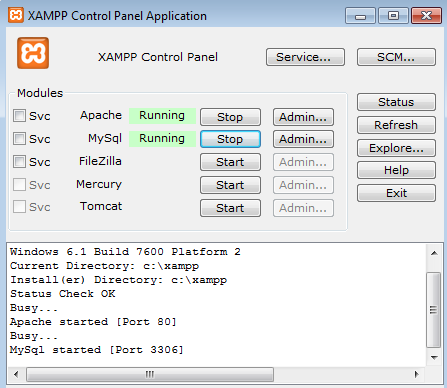 For the installation or removal of services will work, the XAMPP Control Panel has to be started as an Administrator. This can be accomplished by right-clicking the icon and selecting "Run as an Administrator". N.B.! If the Control Panel is closed with the X of the window, it wil remain running in the notification area of Windows. It can be brought up again by clicking the icon in the notification area. If Windows Firewall is in use, it will probably ask at this point, whether to allow access to Apache from the network. If you use MLInvoice only on this computer, it is recommended to not allow the access. In this case MLInvoice can only be accessed on the computer it is installed on. This applies to other firewall software too. With MySQL it is recommended to disallow connections from network in any case. Click the Admin... button at MySQL in the XAMPP Control Panel so that phpMyAdmin is opened in the browser. Now that XAMPP has been prepared, MLInvoice can be installed. Since Windows does not show file extensions by default, are the following operations to create the configuration file done in the command prompt. After the last command MLInvoice config file is opened for editing. and change it to the password for the user you created previously in phpMyAdminissa. 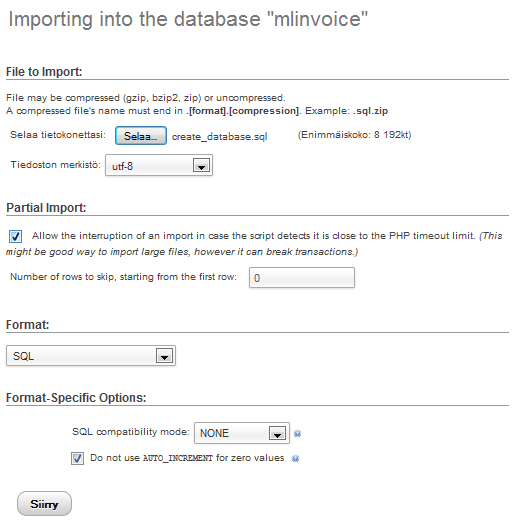 This is required for MLInvoice to be able to access the MySQL database. Other changes are not required, so save the file and close WordPad. Finally, the database tables need to be created. Select file c:\xampp\htdocs\mlinvoice\create_database.sql using the button at "Browse your computer"
IMPORTANT: Change admin user's password from System -> Users. Change the settings to suit your needs in Settings -> General Settings. Keep in mind that Apache and MySQL must be running for MLInvoice to be accessible. If you did not set them up as services, they need to be started separately from the XAMPP Control Panel.